Take some water in a bowl and add dry yeast with sugar. Set aside for 5-6 mins. In another bowl, take maida and mix salt in it. Make a well in center of bowl. Add the yeast mixture and some oil. Mix them all together and form a sticky dough and knead it for 10 mins. Brush a bowl lightly with oil and sprinkle some maida in bowl. Put dough in it and set aside in a warm place to rise until its doubled in size (approx 1 hour). Once done, punch it well to remove air. Make small balls (5-6) out of it and roll it thick to make toast base. Bake them in pre-heated oven for 5 mins on 180 degrees. Heat oil in a pan and add sliced mushrooms in it. Saute it for 2-3 mins till they are little soft (Make sure you don’t overcook them, else it will start releasing water). Season it with salt and pepper powder. Mix well and transfer it to another bowl to cool down to room temp. Arrange these mushrooms on toast base as a topping and sprinkle cheese over it. Bake it for 10-12 mins until toast-crust is crisp & light-brown in color. Serve hot as an appetizer or side dish!!! 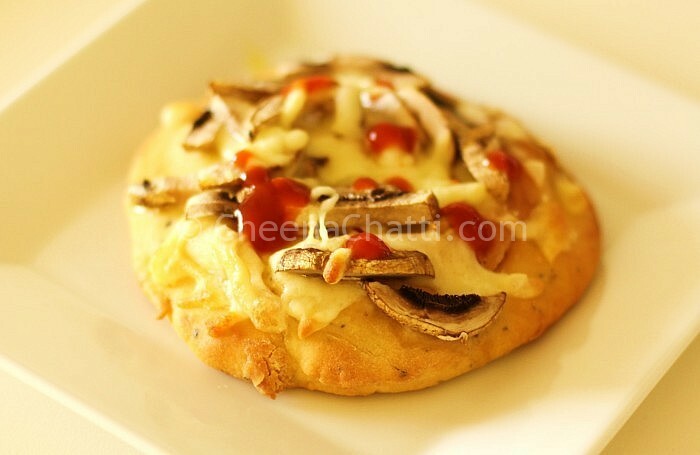 This entry was added on June 24th, 2013 by SJ in Vegan and tagged with mushroom toast points, mushroom, best mushroom toast, mushroom toast cups recipe, mushroom toast appetizers, mini mushroom toast, make mushroom toast, vegetarian, evening snack. Last revised on April 4th, 2018.